November 2018 www.coalage.com 39 operating ideas continued using fire hoses in the company's fire gal- lery. To improve mineworkers' procedural knowledge and understanding of refuge alternative setup and operation, company trainers revised this training by grouping related activation and setup steps into logical step clusters. Trainers used spe- cific feedback from the survey and from trainees' recommendations to develop this training, with the intent of making the process more intuitive. Early Results: Increased Engagement and Personal Accountability When NIOSH researchers spoke with the company's training coordinator about the results of these competency-based training, assessment, and remediation ef- forts, the coordinator mentioned that he had seen improvement in his workforce's self-escape KSAs as well as their attitude about health and safety training at the mine site. He reported that, in his opinion, the workforce was more engaged in their training, more willing to ask for specific trainings that they were interested in or felt were necessary (e.g., more realistic and hands-on escape training, including using live one-hour SCSR units as well as live 10-minute units, etc.). The trainer also re- ported that mineworkers were more eager to ask questions when they needed more information or help on a subject and were open to admitting when they were strug- gling on a training topic, demonstrating increased personal accountability for their self-escape preparedness. Mine rescue team members, who as- sisted in carrying out the expectations and fire prevention training, similarly reported having seen marked improvement and increased engagement among the work- force, noting that mineworkers seemed to be asking more questions and partic- ipating more enthusiastically compared to prior years. To reinforce the year-round retention of self-escape KSAs and to continue to de- velop trainings that are tailored to specific competency gaps among the workforce, the training coordinator plans to incorpo- rate additional assessment and remedi- ation strategies into the mine sites' quar- terly escapeway drills. This will enable consistent and targeted self-escape KSA monitoring and improvement. 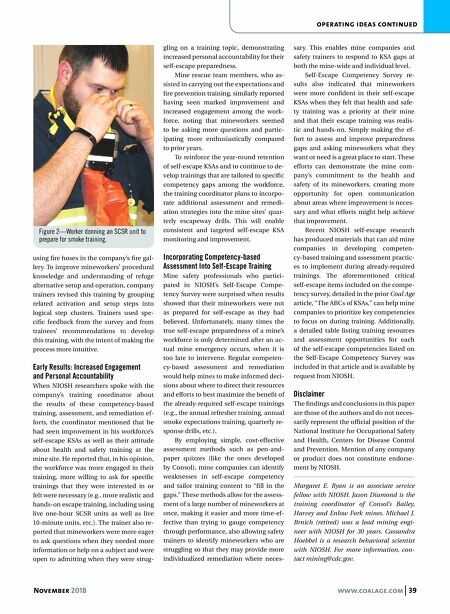 Incorporating Competency-based Assessment Into Self-Escape Training Mine safety professionals who partici- pated in NIOSH's Self-Escape Compe- tency Survey were surprised when results showed that their mineworkers were not as prepared for self-escape as they had believed. Unfortunately, many times the true self-escape preparedness of a mine's workforce is only determined after an ac- tual mine emergency occurs, when it is too late to intervene. Regular competen- cy-based assessment and remediation would help mines to make informed deci- sions about where to direct their resources and efforts to best maximize the benefit of the already-required self-escape trainings (e.g., the annual refresher training, annual smoke expectations training, quarterly re- sponse drills, etc.). By employing simple, cost-effective assessment methods such as pen-and- paper quizzes (like the ones developed by Consol), mine companies can identify weaknesses in self-escape competency and tailor training content to "fill in the gaps." These methods allow for the assess- ment of a large number of mineworkers at once, making it easier and more time-ef- fective than trying to gauge competency through performance, also allowing safety trainers to identify mineworkers who are struggling so that they may provide more individualized remediation where neces- sary. This enables mine companies and safety trainers to respond to KSA gaps at both the mine-wide and individual level. Self-Escape Competency Survey re- sults also indicated that mineworkers were more confident in their self-escape KSAs when they felt that health and safe- ty training was a priority at their mine and that their escape training was realis- tic and hands-on. Simply making the ef- fort to assess and improve preparedness gaps and asking mineworkers what they want or need is a great place to start. These efforts can demonstrate the mine com- pany's commitment to the health and safety of its mineworkers, creating more opportunity for open communication about areas where improvement is neces- sary and what efforts might help achieve that improvement. 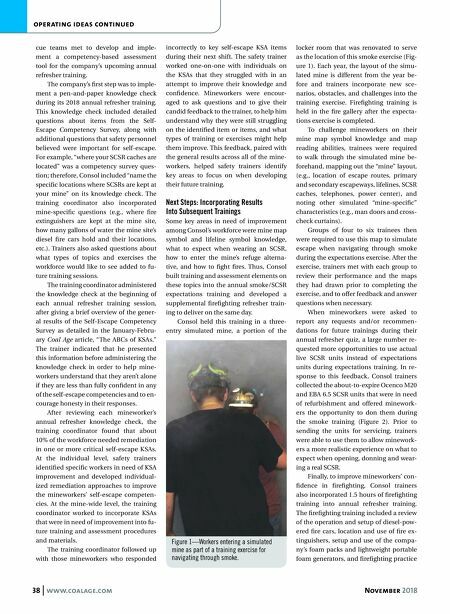 Recent NIOSH self-escape research has produced materials that can aid mine companies in developing competen- cy-based training and assessment practic- es to implement during already-required trainings. The aforementioned critical self-escape items included on the compe- tency survey, detailed in the prior Coal Age article, "The ABCs of KSAs," can help mine companies to prioritize key competencies to focus on during training. Additionally, a detailed table listing training resources and assessment opportunities for each of the self-escape competencies listed on the Self-Escape Competency Survey was included in that article and is available by request from NIOSH. Disclaimer The findings and conclusions in this paper are those of the authors and do not neces- sarily represent the official position of the National Institute for Occupational Safety and Health, Centers for Disease Control and Prevention. Mention of any company or product does not constitute endorse- ment by NIOSH. Margaret E. Ryan is an associate service fellow with NIOSH. Jason Diamond is the training coordinator of Consol's Bailey, Harvey and Enlow Fork mines. Michael J. Brnich (retired) was a lead mining engi- neer with NIOSH for 30 years. Cassandra Hoebbel is a research behavioral scientist with NIOSH. For more information, con- tact mining@cdc.gov. Figure 2—Worker donning an SCSR unit to prepare for smoke training.